John H. Carlson, age 51, of South Milwaukee Street, Fredonia, WI passed away Thursday, November 27, 2014 at Aurora Medical Center, Grafton, WI. He was born on August 1, 1963 in Johnstown, PA to William and Frieda Marsinco Burkett. In the 1970’s, he and his family moved to Milwaukee later moving to Cedarburg. For many years, John worked for Exacto Springs Corporation of Grafton, WI. He resided in Fredonia since 1989. He was always fond of reading and photography. 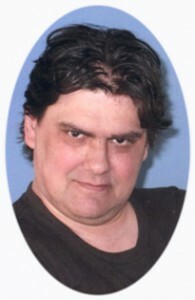 He was an avid gamer, also proud of his wolf collection and Native American aspects. He is survived by his children Michael and Stacey Carlson of Lyndon Station, grandson Lyric, his parents Frieda and Richard Carlson of Fredonia, his girlfriend Jackie Jenkins, brothers Aaron Carlson of Fillmore and Matthew (Sharmayne) Carlson of Fredonia, his sister Melissa Carlson of Appleton, nieces, nephews, other relatives and friends. He is preceded in death by his brother Billy Burkett and his grandmother Pauline Krupa. Funeral services 6PM Wed. December 3, 2014 at the funeral home. Reverend Thomas Fleishmann officiating. Visitation 4-6PM Wed. prior to service. Interment Benshoff Hill Cemetery, Johnstown, PA.
My prayers go out to Aunt Frieda and family and his daughter Stacey,and Lyric and his son Michael in the loss of there son, father and Uncle.